Bernard (Peter Baldwin) has tried having a relationship with Claudia. He likes her. She loves him. He feels like he should love her, but he either doesn't or is unsure of his capacity to love her or anyone else for that matter. He just feels empty inside. He calls it quits over the phone. Her last words to him are "I won't forget you." Bernard decides to run away from his problems and takes an extended vacation to a place he's visited on and off throughout the years ever since he was a child. He arrives in the small, quiet, peaceful, lakeside village during the wintertime; the tourist off-season, when not many other people are around aside from the locals. Bernard goes to a hotel where the owner and staff know him because he was just there the previous year. A writer, Bernard claims he's there to work on an autobiographical book, but he's actually there for another reason: Tilde (Virna Lisi). Tilde was a very attractive young maid from the wrong side of the tracks who'd worked at the hotel the previous winter when Bernard had visited. Despite the fact the two were never intimate and barely even knew each other, she made quite the impression nonetheless. Bernard had followed Tilde back to the old hotel and spied on her making love to a man whose identity he couldn't quite make out before he left the previous year. It's one of those moments he's not been able to forget and he's been infatuated with her ever since. She's also perhaps the reason he's not been able to successfully move on in his love life; one of those "What if...?" moments in life that hangs over our heads until they're resolved. Because of the lasting impact their brief encounters had made on him, Bernard has decided that he wants to be with her. Unfortunately, he learns that she committed suicide by drinking poison. Francesco (Pier Giovanni Anchisi), a hunchback photographer in the area, believes otherwise and informs Bernard that not only did they find poison in the girl's system, but she'd also had her throat cut. He also believes she was pregnant (and has photographic proof) and was possibly murdered for that very reason. Rumor around town has it that the wealthy hotel owner Mr. Enrico (Salvo Randone) had paid off the cops and doctors, who have in their autopsy report that she died a virgin, while Bernard certainly knows better. Now intrigued by what's going on and fueled by his obsession to discover the truth, Bernard tries to find out all he can about about the intriguing girl. He learns her father Saverio is a guilt-stricken drunk living as a vagabond who occasionally comes into town to curse at the hotel and its owners. Mr. Enrico seems overwhelmed by sadness at the mere mention of Tilde's name, as does his put-upon daughter Irma (Valentina Cortese). Living across the street from the hotel is Enrico's son Mario (Philippe Leroy) and his wife Adriana (Pia Lindström), who run a slaughterhouse. The townsfolk are scared of Mario and his violent temper and he may have been the young man Bernard saw Tilde making love to the previous year. Adriana is a foreigner new to the area who seems almost like she's being kept prisoner inside her home. She never comes outside during the daytime and likes to take lonely strolls after midnight. When she unsuccessfully tries to pass along a note to Bernard, she too ends up dead; drowned in the very lake she'd usually take her late night walks around. 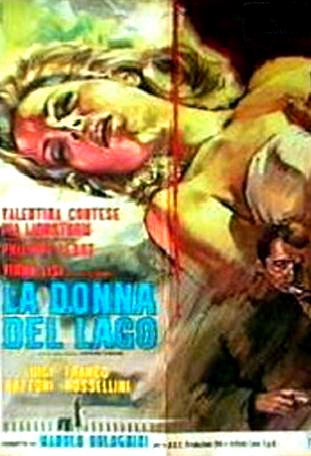 Often listed as a giallo, I suppose this qualifies to an extent because it's an Italian murder / mystery. However, it lacks the violence, slasher scenes and sleaze one usually associates with that subgenre. This is much more of a stylish, eerie mood piece. It's well acted, very well made and really gorgeously photographed in black-and-white. Through much of this film, Bernard is suffering from a fever, which may be due to slowly being poisoned, though we're never explicitly told that for sure. He's the ultimate in unreliable protagonists, not only because he's confessed to being "sick" earlier in the film but also because part of what we see are hallucinations or fantasies. Some of the scenes which relay information to us are simply fever dreams that play out his own hunches and expectations about what's going on, not what's really going on. These are seamlessly integrated into the film at various points to parallel what we are probably thinking and are an attempt to dash our expectations as we try to sort out the mystery in our own heads at the same time the protagonist is. It's an interesting idea and fairly well executed here. For the flashback and many of the fantasy sequences, the directors and cinematographer have interestingly toyed around with the film exposure to give them a hazy, dream-like appearance. These sequences are overexposed, drowned out in light and sometimes even blurry. Much of the action and character movement in these scenes even leave behind phantom trails; a very cool effect. Lady of the Lake also brought to mind Polanski's classic The Tenant (1976) on multiple occasions. There's lots of voyeurism and tons of shots of suspicious people looking out of windows watching the action or each other. Four writers are credited, including both directors, Renzo Rossellini and Giulio Questi, who'd go on to direct the surreal films Death Laid an Egg (1968) and ARCANA (1971). It's based on a novel by Giovanni Comisso. Bazzoni returned with a more standard giallo: THE FIFTH CORD (1971) a few years later and the sometimes-admired Footprints on the Moon (1974). To my knowledge, Lady was never released in America. It's definitely worth tracking down for mystery fans, though.